MULTI-TALENTED Army troops, now in the process of undertaking responsibilities, related to development work, are about to complete one more gigantic project in the East after it was entrusted to the Army just fifteen months ago. Three phases of the Somawathiya-Seruwavila (A-15) road restoration and construction project that covers a stretch of about 30.7 km were entrusted to the Army Engineers back in April 2008 after the Army cleared those areas of the terrorism that affected those areas for so many years. 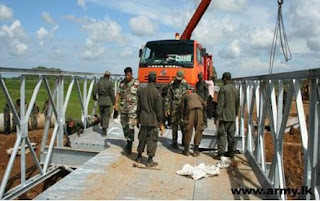 Army Engineers under the phase one completed construction and restoration from Seruwavila to Arippu Junction, a distance of about 6.7 km. Under the second stage, troops cleared jungle areas on both sides of the road and laid out the draining system extending up to Verugal Aru. That covered another stretch of about 7 km. This jungle clearing is still continuing. The first layer, stretching about 700 m from Thrikonamadu towards Kinnerikulam was successfully laid in time despite rains and other natural impediments. The Army expects to clear jungles from Thonithatumadu to Verugal Aru, construction of the draining system and culverts, and filling of the road from Arippu Junction up to Thrikonamadu within next couple of months. The Army with the help of its machinery plans to complete the entire project within next eighteen months. The entire Army’s involvement will cover 45 km while Mahaweli Authority and Road Development Authority are expected to complete the remaining phases.